Two books from Wednesday, May 7, 2014. Plus your Nerd Confessions (about the best day jobs in comics). 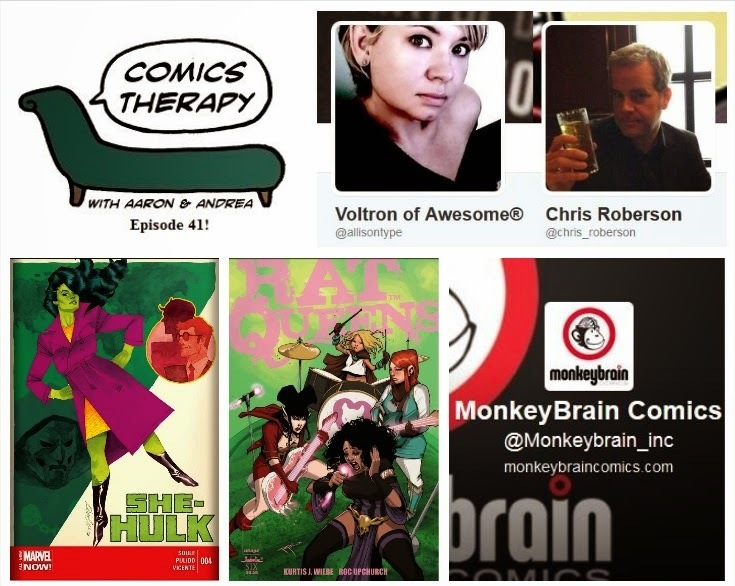 On The Couch: Allison Baker and Chris Roberson from MonkeyBrain Comics. Don’t quit your day job. No, really. That’s the theme. We’re looking at two comics where the character’s jobs are an integral part of their identities in very different ways. For most of us that’s true in real life, too. The question is, do we define our jobs or do our jobs define us? We are also looking at this through the lens of predominantly female characters, bringing up all sorts of interesting things about empowerment, gender roles and stereotype. Some of which makes us uncomfortable to discuss. What do you want to be when you grow up? What's your major? Who do you work for? Tracing the point at which our jobs and our identities are first inextricably linked, in the hopes of understanding why a hero would still want to practice law after she became super. Four female characters in the traditional male role of adventurers for hire. Sounds great. Equal rights for everyone. Or are there? Turns out defining the personality traits of a female mercenary are even more difficult than we thought. The publishers behind MonkeyBrain Comics, Allison is a film and political media producer and Chris is a prolific writer of both prose and comics. He’s the co-creator of the Eisner-nominated comics series iZombie, currently in development for television by the CW and he writes a great many other things including Edison Rex, drawn by Dennis Culver who we talked to back in Episode 35. Allison handles the day to to day operations of MonkeyBrain and her column Allison Types appears on ComicBookResources.com. They are both awesome in vastly different yet compatible ways, which is probably why they’re content to both live and work together.